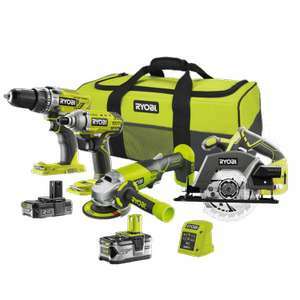 If you need all the pieces its not bad value but in November you could get a kit from B&Q with the drills, circular saw and 2x 1.5Ah batteries for £175. As soon as you don't use one of the pieces in the kit much you are better buying a smaller kit and adding what you need. Ryobi is absolute rubbish. The build quality of thier stuff is the same as Chinese non-brand that is sold for half the price. Almost everything we get in for service is uneconomic to repair. Avoid. Ryobi is absolute rubbish. The build quality of thier stuff is the same as …Ryobi is absolute rubbish. The build quality of thier stuff is the same as Chinese non-brand that is sold for half the price. Almost everything we get in for service is uneconomic to repair. Avoid. My experience couldn't be further from this. I have several tools but my oldest (a driver) is about 7 years old and faultless to this day. Complete opposite for me. Love their stuff and have a lot of it. Wish I'd done this but I bought all the bits separately now. That charger will annoy you it's super slow. Homebase in Ashbourne has exdisplay ryobi at half price. I pick up a ryobi drill, no battery for £25.